Golf is a game to be enjoyed. Three components, attitude, ability, and equipment allow us to enjoy this great game. The first two are up to you. The third is where we can definitely help. Having clubs built for your unique swing will not only make for more consistent results but will give you more confidence in your shot making. Consistency, is what we're all looking for. John Greenwood has had extensive experience working with all skill levels of golfers, from beginners, weekenders, club pros, to long drive competitors. This experience has allowed John to quickly assess swing patterns unique to the individual golfer and to recommend a proper shaft, head, and grip combination. John has worked with shaft manufacturers in designing shafts for his specific client's needs. Along with his extensive club-fitting experience, John employs the Zelocity PureLaunch monitor to bring you the latest in launch monitor computer analysis. Club head speed, ball velocity, launch angle, spin rate, carry distance, angles at impact, and power transfer, is just some of the data collected. But this is not enough. While hitting off real grass at a full golf range, John will observe your actual ball flight to insure a perfect match between yor unique swing and the golf clubs built specifically for you. 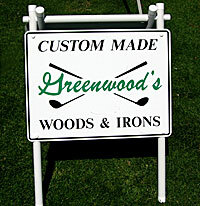 This combination of experience and technology by Greenwood's Golf is your path to enjoying this great game to its fullest. is an informative blog entry from Eric.